The little lord often rubs his eyes and that's the tell tale sign that it's time for bath time and bed. We have a 20 minute window before our normally placid baby who has been squeaking delightedly at the cat moments before will suddenly kick off and 'go beyond'! The other thing is that since he started baby led weaning, his hands are usually covered in pulped avocado, banana and all sorts of other treasures that he will happily rub into my face as I carry him up for bath time, and I squirm inwardly whenever he rubs his eyes. 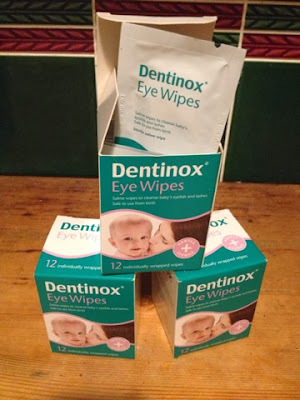 So when Dentinox sent me three boxes of their Eye Wipes to review it was a godsend. Yes, I think you can tell where this review is going, can't you! With 12 wipes in a box and each one individually wrapped and sterilised they are ready for immediate use. No need for faffing around with boiled water and cotton wool, these babies are good to go. Safe to use from birth, the saline wipes have been designed by Dentinox to cleanse eyelids and lashes, as well as clean out any unwanted goo, and the material is soft and gentle and easy to use while out and about. I have done a bit of research, and it turns out that babies tend to suffer from sticky eyes due to the size of their tear ducts and the way they develop. With some babies, tear ducts are underdeveloped and it takes a bit of time for them to be fully functioning. Click here for some useful information about this. It's often noticeable after a sleep, but as they get older it will usually stop happening. It would definitely be worth stocking up on the eye wipes if you are a new parent as newborns are renowned for it! I can remember when C was born he used to have gunky eyes all the time, but it's a rarity now. I'm now more worried when he has half a banana smeared around his eyes (self inflicted of course!) so we've been using the wipes after meals and before bedtime to freshen him up! Look at that! Clean eyes for a change! Please note, this post was sponsored by BritMums. All opinions are my own though.. So pleased you liked the wipes and found them handy. Commenting for myself and on behalf of BritMums and thanking you for taking part. I'd forgotten the horror of mushed food in the eyes! We're still on newborn gunk atm & are loving the wipes! I'm definitely finding them useful for the mess that is weaning the twins too - they always rub their food covered hands in their eyes don't they? Eye doctors are a constant boon to our lives. We live in fear of the unseen and where vision is compromised, a lot is lost.